I had two Thanksgiving celebrations this week. Both vegan. Both potluck. That meant cooking even though I wasn’t hosting. 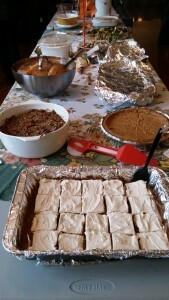 The first celebration was the Sunday before Thanksgiving. Since I live close to Portland (sometimes known as Vegan central) there are a lot of people interested in a vegan celebration. 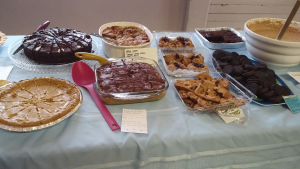 Every year the Northwest Veg group prepares a very large potluck celebration. This year they only had 300 seats. It filled up quickly. Lucky for me I signed up early and got a spot. Last year I waited too long. The hall where it took place is actually a large building in the middle of an amusement park. It was 45 degrees out with a brisk wind so there was no chance anyone was interested in the park. As I’d never been to that part of town I headed out extra early. It actually was easy to find, right off the Sellwood bridge. After finding a spot for my sweet potato spiced muffins I decided to check out what everyone else brought. 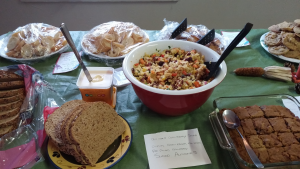 The nice thing about vegan potlucks (well the ones I’ve been to anyway!) is that everyone includes a note with the ingredients by their dish. This helped me plan out which dishes I could eat and which table to hit first. 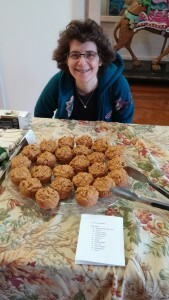 Here I am with my muffins. I make these muffins about once or twice a month. They are pretty easy to make as long as you have fresh sweet potatoes. That’s the key to making them delicious. I took a few pictures as I was walking around. It’s an amazing variety all made from plant based food. So back to the muffins. I found the recipe at Savvy Vegetarian. I’ve incorporated a few of her tips to make these oil free. Make sure you check out her site as there are plenty of plant based recipes. Cook and mash the sweet potato ahead of time. I usually do this a day ahead. You can make the oat flour by grinding quick or rolled oats in your food processor. Add the cider vinegar to the non-dairy milk and set aside. In a large mixing bowl whisk together the whole wheat pastry flour, oat flour, sugar, baking powder, baking soda, cinnamon, and ginger. Set aside. In a second bowl whisk together non-dairy milk mixture, mashed sweet potatoes, and applesauce. Add the wet ingredients to the bowl of dry ingredients. If you are using raisins (I recommend this!) add them as well. Stir everything together until just mixed. Don’t over stir as this will make your muffins heavy. Spoon batter into a full sized non-stick muffin pan. You can grease the muffin pan if it’s not non-stick or look for some silicone muffin liners. 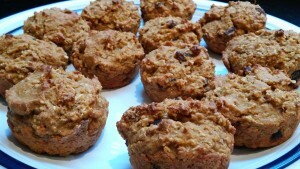 The muffins are done when they are firm and a little brown around the edges. I usually test them with a toothpick to see if they need a few more minutes. Enjoy them warm or let them cool. You can freeze them once they’ve cooled. Just take a frozen muffin to work and it will be perfect when lunchtime comes around.